A quick and healthy meal packed with goodness. 1. Beat the eggs and coriander together very lightly in a bowl, just to combine the yolks slightly; season. Rinse the shredded greens under cool water in a colander. Shake dry. 2. Put the oil and garlic in a medium, non-stick frying pan and place over a medium heat. When the garlic just begins to sizzle, add the rinsed greens (working in batches if needed), season, turn the heat up and stir-fry for 2 minutes, until wilted. Tip onto a plate. 3. Return the pan to the heat, turning it down to medium-low. Add ½ the butter. Once gently foaming, add ½ the egg, swirling it around the pan. Use a spatula to draw the egg in from the edges, swirling any liquid egg into the gaps. Once just set on top, pile half the greens into the centre, fold the omelette in half and slide onto a plate. Wipe out the pan and repeat to make a second omelette. 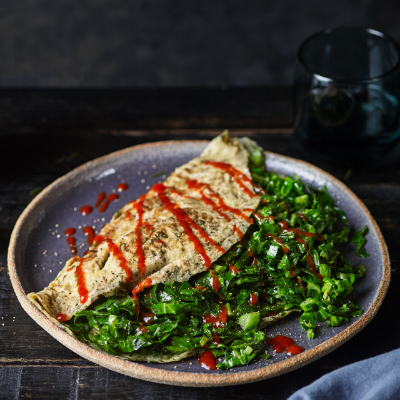 Drizzle with sriracha sauce to serve.